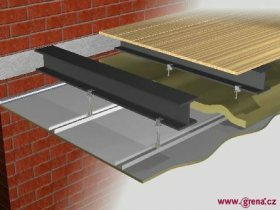 Floor steel beams protected by Grenaboard ceilings is valid for all types of steel profiles IPE, HEB, HEA, square profile etc., from dimensions of 20 mm. Obr. 1. Floor steel beams protected by Grenaboard ceilings, trapezoidal floor. Obr. 2. Floor steel beams protected by Grenaboard ceilings, wood board floor. the material of the floor above the steel beams is not limited. It is possible to use different materials. steel designed temperature calculated for 500 °C. Please contact Grena a.s. representive for other conditions. Fire-resistant ceilings or ceilings inside a fire compartment which contain soffits (soffits with dependent function) are assessed as a whole. The contribution of the fore-resistant and protective function of suspended ceilings with dependent function, which enhances fire resistance of the ceiling structure, depends on the characteristics of the soffit as well as ceiling structure. Fire-resistant ceilings or ceilings inside a fire compartment with suspended soffits (soffits with independent function) where fire load occurs between the soffit and the ceiling structure (such as cable distribution systems, pipes containing flammable liquids or gases, etc.) and where the sofft has a fire-resistant and protective function, are assessed either as two independent horizontal structures, and the pace between the soffit and the ceiling is regarded as an independent fire compartment, or under certain circumstances, they are assessed as whole. In all cases where fire load occurs between the ceiling and the soffit structures, the soffit structure is to be assessed both from the upper side (with respect to fire load above the soffit) and from the lower side (with respect to fire risk under the soffit). For all types of ceilings and suspend ceiling (soffits), very light and strong non-combustible boards Grenaboard are suitable.